I have been trying to figure out: What is third world? It has a lot to do with poverty and access to the functioning systems that first world communities take for granted. Life here in deep-rural KwaZulu Natal province is a mixed bag. Some people have electricity, cars, computers, televisions, substantial Western-style houses. Most do not. Most do not have indoor plumbing. Third world may be when you take a wheelbarrow full of large empty plastic buckets to a water source away from your dwelling, hoping there will be water, and then spending time filling up all (hopefully) your buckets, putting the now very heavy buckets in the wheelbarrow, and wheeling them to your home. It can often be a time of socializing with neighbors as you all wait your turn to have access to the water. This work is most often done by women and children (male or female). All this carrying, hauling, and waiting is because in the area where I live there is no functioning water system. Water is trucked in from somewhere else and delivered to communal water tanks, JoJos, or to someone’s home tank. Here is another example: the children at Okhayeni Primary School are fed each morning at 9:45 according to a feeding scheme. 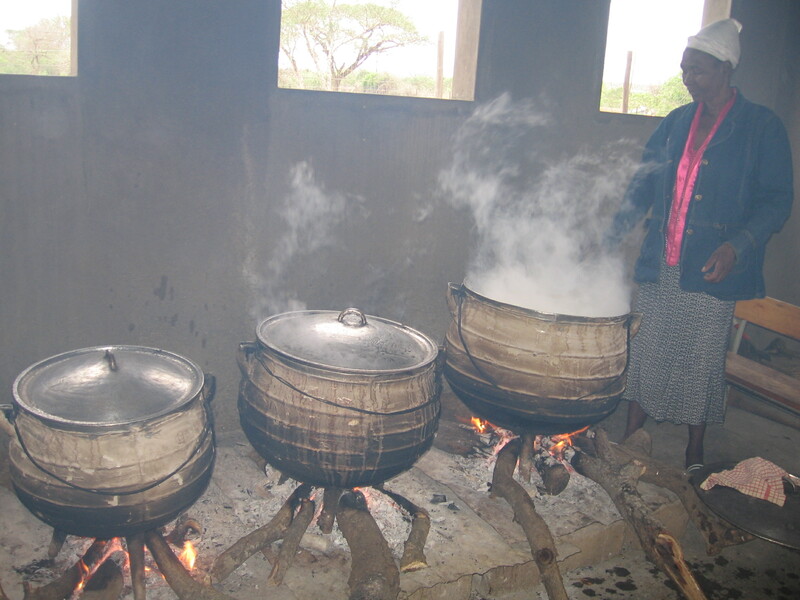 The government provides money for the food through a contracted provider and a few mothers are paid a small amount of money to come to the school kitchen to cook the food for 472 learners each school day. 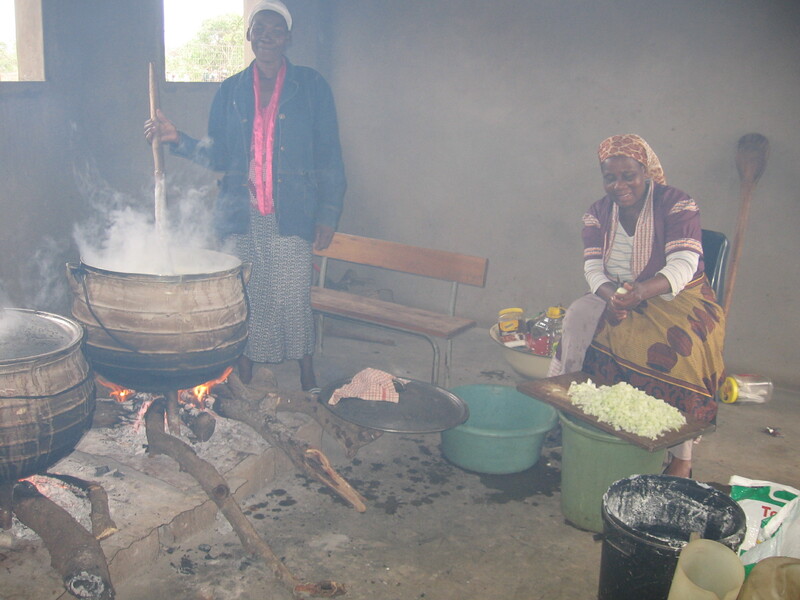 I went into the kitchen today and discovered the women are cooking the food (today it was pap and beans) over three open fires on the concrete floor, in big round iron kettles. It is very smokey in there. They chop the vegetables on small cutting boards. The kitchen building is new and as yet unfinished. It is a windowless concrete shell with no running water or kitchen appliances. The food is delivered to the classrooms in two large buckets. Teachers dole out the food (one starch and one protein) to the learners onto small metal plates. The children can have as much as they want. They eat with their fingers; no spoons are provided. The children go to a water bucket and wash their own dishes. This may be their biggest and most substantial meal of the day. The school hopes one day to have a more modern kitchen. 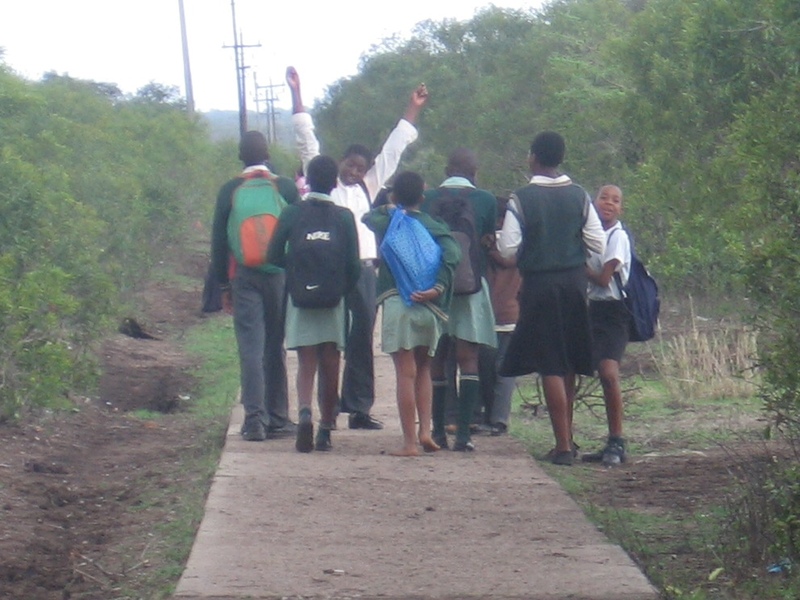 Here is yet another example: Children wear uniforms to school in South Africa. At Okhayeni, there are several variations they can put together. Boys wear dark trousers, ivory short or long sleeved buttoned shirts, a green/ivory sweater vest or green/ivory long-sleeved sweater (jersey). Girls have a one-piece green/white gingham dress, or an ivory buttoned blouse and a black skirt. They also have the same two choices in a jersey. They wear dark green socks with two ivory stripes. Some wear ties. Some children wear the regulation black shoes. Many of the learners wear no shoes or socks at school or at home. Their little feet must be like leather because they easily walk on all kinds of terrain with no problem. Many of the uniform parts are in poor condition–ripped, hem partly unsewn, shoes without laces or untied or unbuckled, shoes with the back flattened and walked on, yarn unraveling, holes in socks. They most likely have been worn by older siblings and saved for the younger ones. There are some children, especially true as they get older, that wear neat, clean, ironed, mended uniforms with polished shoes and socks with no holes. They are few, however. At the beginning of the school year, a survey is made of which children have no uniform or a uniform in poor condition. The local NGO helps parents in need to purchase a school uniform for that child. Shoes are also donated. Children from Okhayeni walking (and posing) along the paved sidewalk home from school. They are wearing all varieties of the school uniform, with and without shoes. Trash. A first world problem, a second world problem and a third world problem. I walk home 2 kilometers from my school each day along a paved sidewalk, as do the children in my area. It is a much safer alternative than walking along the busy highway parallel to the sidewalk. This pathway and every pathway, dirt road and highway are littered with the trash of our use-it-once, throw-it-away world. Chip bags. Coke bottles. Candy wrappers. Plastic bags. Tires. Rusty metal. You name it, it is there. The wind blows it around and some adheres to the bushes. It fills the mud puddles when it rains. Here is the third world part: no garbage service as far as I can tell. Individual families burn their trash in a fire pit somewhere on their land, as does our school, which is very clean. Sometimes they take it and dump it somewhere else. There are no color-coded bins for paper, cans, bottles, compost, garden waste. When you are finished eating a snack on the taxi, you slide open the window and throw your trash out onto the road. 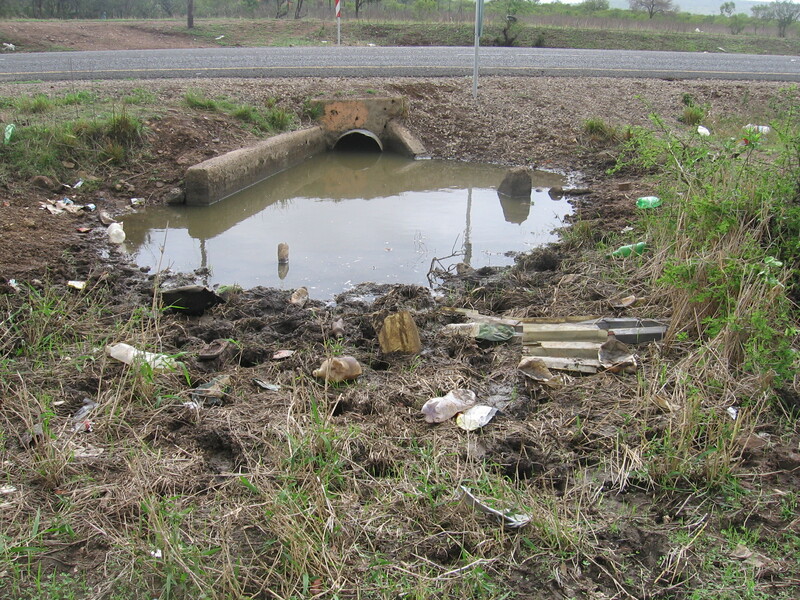 If you are walking along the path or road, eating a snack, the trash is just thrown on the ground. There is trash in the river. There is trash all over town (village). It is disgusting and ugly and no one seems to mind but me. (Of course I have no way of knowing if that is true.) I do not see trash bins in town. There must be some sort of clean-up at the end of a day because otherwise it would be waist deep. I just haven’t seen it. I have heard there is a land fill somewhere. I have also heard there is a recycling center in Jozini. I will investigate further. Every third world country I have been in has the same mess accumulating. South Africa is first world (the cities) and third world (deep rural). I assume the cities have garbage service. My particular peeve with the third world: I must be in a dip in the landscape. I get internet service sporadically on my 3G phone which can tether to the IPad for wifi. It is really hard to send anything, especially the photos for the blog, when the service lasts less than a minute at a time! It is my lifeline to all of you in the outside world and it distresses me when the line is cut. How brave PC volunteers were before the possibilities of internet! On another note: two weeks ago, when I couldn’t stand being alone one more day, I invited myself to Peter and Marianna’s place in Manguzi. I spent a wonderful day and a half with them and managed to see most of the other Manguzi PC volunteers as well. The highlight of the weekend (besides being with this warm and welcoming couple) was the informal tour given to us by an Afrikaaner man they met in town. He sells cooking and heating fuel. He put us in his reliable 4-wheel drive Nissan and took us into the back country to beautiful Kosi Bay and the next day to the exquisite Indian Ocean. 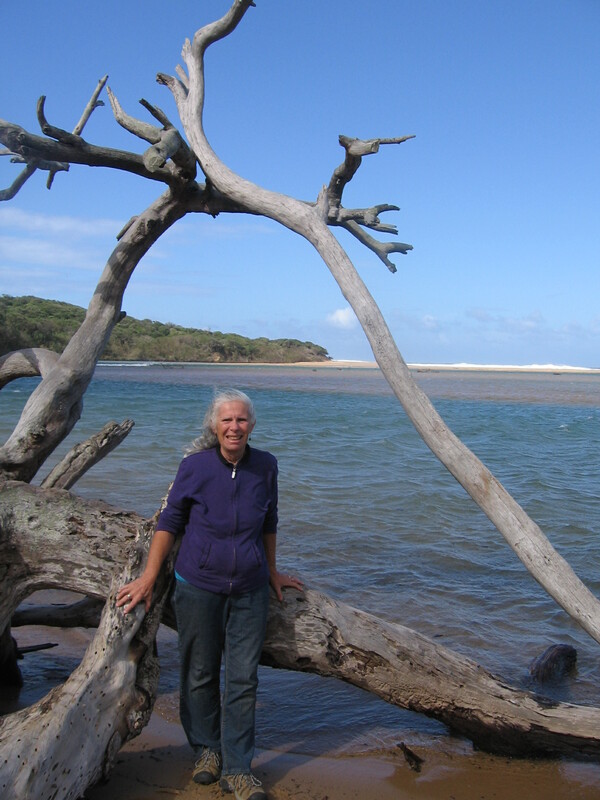 I had really been wanting to be at the ocean and it was a lovely treat on the day before my 69th birthday. I have had a bad cough for a month. I did not want to go to a doctor to get antibiotics but preferred to try letting my body try to overcome it naturally. This last week I gave in. I have been sick way too long. I met the very nice Dr. Oni, in Jozini, who diagnosed my illness as bronchitis and, of course, prescribed a 3-day course of antibiotics. He also was astounded that a woman of my age was willing to come all the way from America to live in deep-rural South Africa for two years. “It is such a sacrifice. Are you a Christian?” I told him I was not and he said that there must be something special that motivates me to do this. True but neither of us could name it. He also said I was in good shape and health for someone my age (as I coughed and sneezed and ached and was nauseous in his office). I sure hope I feel better soon! He is originally from Nigeria, is married to a South African woman, has three lovely children, and loves being a doctor. He, too, is here working in an rural area where there is greater need.